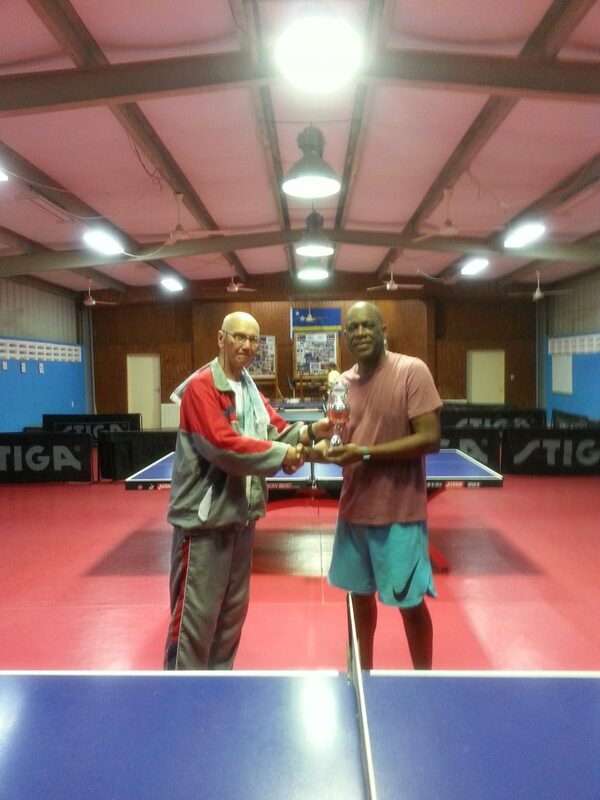 Thursday, March 22nd Curacao Table Tennis Federation had her first Master Tournament VETS 50+ of the 2018. This tournament was honored to Anthony “Tony” Wijshijer as our member for years. Tony played table tennis more than 50 years and played during his studying period in Holland and Belgium at a high level. Tony never won the Curacao title, but had put other big tournaments on his name. Tony played several big local players as Robert Hose, Minguel Pourier and was together with Onny Wong a formidable couple in men doubles. This tournament started with 19 players in a combi knock-out group system. First 3 matches in the knock-out system to get 3 winners, who then joined the other 13 players so 4 groups of 4 players could be formed. After all of these we got finally the last 4 in the semi final, who had to fight for the championship. These 4 players were Peter Wong, Hensley Wentwoord, Nonno Vos and Raymond Begina. Nonno Vos played Hensley and won 3-1, while Raymond against Peter Wong ended 3-0. In the final Raymond won his match against Nonno in easy fashion 3-0.